Japanese side Vissel Kobe are to make a last ditch effort to sign Barcelona midfielder Andres Iniesta at the end of the season. The player's contract at the Camp Nou will expire and it is widely expected that Iniesta will make a move to Asia; however it is understood that his preferred destination is currently China. Michael Keane has reportedly decided to pursue a fresh challenge away from Burnley at the end of the current campaign. Liverpool could be willing to make a move for Burnley defender Michael Keane this summer after having been impressed by his performance against Germany in an international friendly. Premier League leaders Chelsea had sent their scouts to keep a close watch on Roma defender Antonio Rudiger during Germany's 1-0 win over England in an international friendly on Wednesday. On Wednesday night Germany and England will play an international friendly ahead of the weekend's World Cup qualifiers. Although there will still be some outstanding players on display, both teams have seen players that would normally be in the starting lineup having to withdraw with injury. Former Arsenal forward Lukas Podolski has confirmed that he would be leaving Galatasaray for a move to Japanese club Vissel Kobe at the end of the campaign. Former Arsenal forward Lukas Podolski is reportedly a transfer target for Chinese Super League side Beijing Guoan. The German is currently plying his trade for Galatasaray. Lazio will reportedly replace Miroslav Klose with fellow German international Lukas Podolski this summer. The 30-year-old left Arsenal to join the Istanbul outfit on a Bosman last year. Former Arsenal star Lukas Podolski could reportedly seek a return to Bundesliga in the January transfer window. Chilean international Alexis Sanchez is all set to miss out on the opening weeks of the Premier League due to his involvement in the Copa America. Turkish giants Galatasaray have completed the signing of Arsenal forward Lukas Podolski on a three-year deal for a reported fee of £2.86m. Galatasaray have confirmed that they have reached an agreement to sign Arsenal outcast Lukas Podolski during this summer's transfer window. 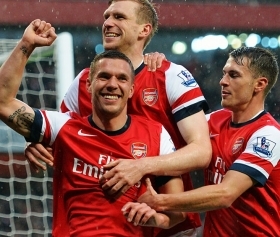 Arsenal manager Arsene Wenger is keen on keeping German international Lukas Podolski at the Emirates beyond the summer. Galatasaray are keen on signing up Arsenal's out-of-favour striker Lukas Podolski during this summer's transfer window. Arsenal forward Lukas Podolski has confirmed that he is in talks with Turkish side Galatasaray over a potential summer move. German international has insisted that he will make a comeback with Arsenal, following a dismal loan spell with Inter Milan. Tottenham Hotspur striker Roberto Soldado could well find himself a way out of White Hart Lane with Galatasaray willing to land his signature. Everton have joined the race to sign an Arsenal player, German international striker Lukas Podolski. The forward will be out of contract next season. German striker Lukas Podolski has insisted that he will look for a new club this summer, should he be offered a bit-part role at Arsenal next season. Galatasaray are interested in signing up out-of-favour Arsenal striker Lukas Podolski in the summer, according to club manager Hamza Hamzaoglu.